Looking for another way to get into uni? We’re proud of our strong partnerships with both Deakin and Federation Universities, which give many of our students the opportunity to transition straight into higher education. 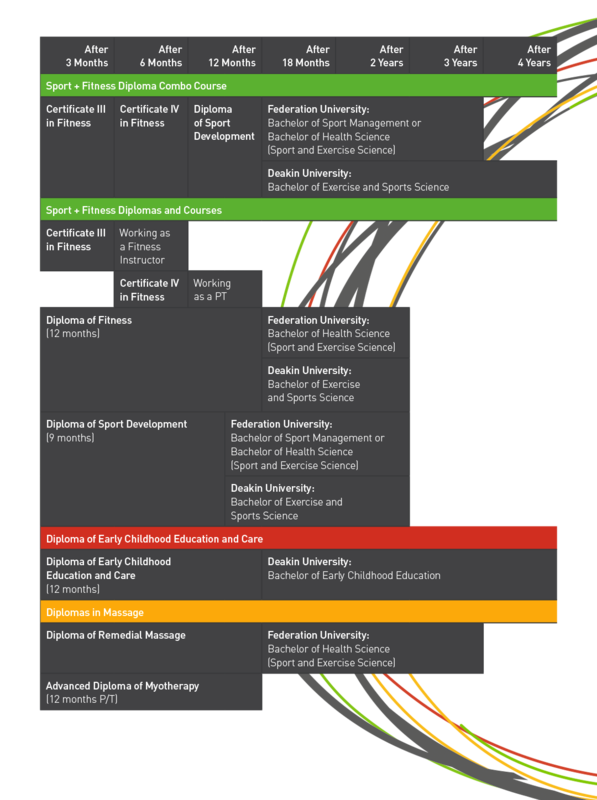 In 2014, around a quarter of our SIS50612 Diploma of Sport Development students went on to university. We’re pleased that 100% of those who applied were accepted into their preferred course. Deakin is in the top 3% of the world’s universities, as ranked by all three of the major international university ranking systems. It has campuses in Melbourne, Geelong and Warrnambool as well as offering courses online via Deakin cloud learning. You can also study close to home in a supported tertiary environment at a Deakin Learning Centre using leading-edge technology. Learning centres provide access to higher education at sites in Craigieburn, Dandenong, Mornington Peninsula, Bass Coast, Portland, Swan Hill and Werribee. FedUni (previously University of Ballarat) has been rated with 5 stars for teaching quality six years in a row*, and has the highest graduate employment rating** of any Victorian-based public university. Guide only and course length and pathways may vary.